TongaFootball > News > Just Play Sport 2 Life workshop! > Stay in the Game! inJust Play Sport 2 Life workshop! Stay in the Game, Build Your Team, Look and List, Come to Play, Use Your Voice and Priority-Goal- Plan! learn and explore through football. Building on the program’s success, at the beginning of this year, Just Play introduced a new program, targeting children aged 13-16 years of age. by helping players to develop the skills to make consistent, long term, healthy lifestyles choices on and off the pitch. was also present to assist with the workshop. Palombi says, ‘’The Just Play 13-16 years programme helps children to learn how to apply the life skills they learn on the football pitch to aspects of their daily lives. ‘’The S2L concept, helps coaches, by providing them with a series of key coaching words that help them to reinforce life skills learned as part of each Just Play session. guide players to think critically, review how they are playing and think about how they can work better as a team, maximize their strengths and perform better. Palombi adds, “That Tonga is very unique to the other Just Play countries, in the sense that the programme is delivered primarily in communities. Palombi was excited to be here in Tonga for the workshop and her first visit to the kingdom and expressed her gratitude to Tonga Football for their warm hospitality. “The Just Play team in Tonga is doing a great job and I am looking forward to liaising with them over the coming months to see how the workshop participants progress. to work voluntary for their communities or their clubs. We have a new community who participated in this recent workshop and we will assist them to kick off their program within the next two weeks. 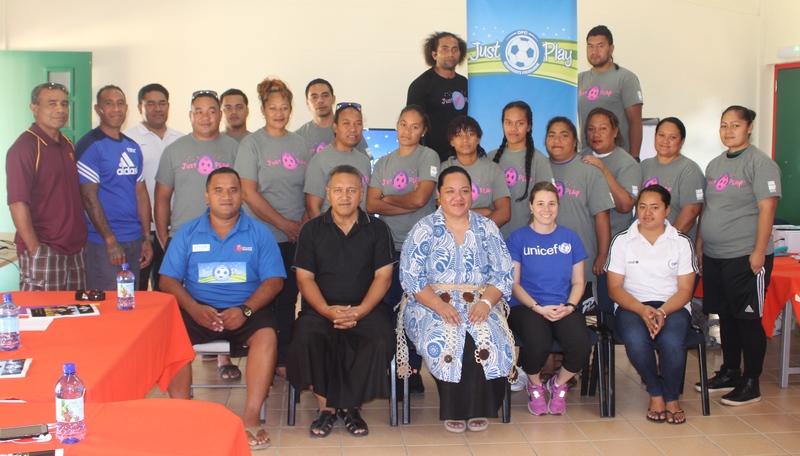 UNICEF Pacific, the UEFA Foundation for Children and the OFC for their continuous support of the Just Play programme in Tonga and around the Pacific. Previous Post Live Healthy, Live Longer and Live Happily!